Our tussock sedge plants have genetic origins in Illinois. 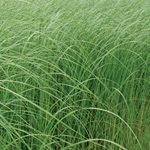 It is a clump-forming sedge whose fountain-like foliage reminds one of prairie dropseed. It is a great plant for rain gardens and will tolerate a bit of shade. Fall color is tan. In dense colonies, it is a good plant for wetland wildlife, feeding numerous moth and butterfly caterpillars, leaf hoppers and grasshoppers, and providing cover for small birds.